McCall's pattern #7116, dated 1994, makes three different pairs of 15" dolls. 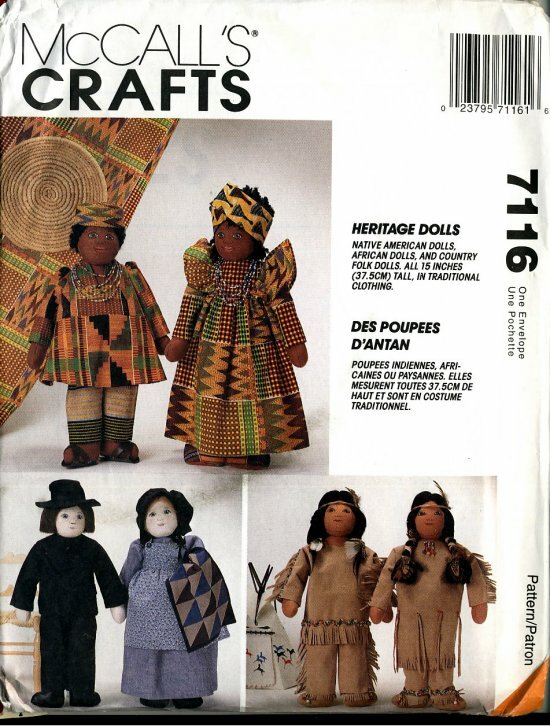 On the front of the envelope, they are called Native American, African and Country Folk dolls. On the instruction sheet, they are called American Indian, African American and Pennsylvania Dutch. The dolls have shaped heads with flat faces. The instructions say to "Transfer facial features," however, there is no iron-on transfer included; the design of the features is printed on tissue paper. The maker is instructed to "fill in facial features using fabric paints and following manufacturer's directions." No other help is given. The dolls' arms and legs are sewn and stuffed separately, then attached to the body. The hands are mitten shaped. The maker is instructed to use "wool doll hair" for the Native American and Country Folk dolls and "yarn" for the African dolls. The instructions for applying it are very brief. The hair is glued to the dolls' heads. The Country Folk/Pennsylvania Dutch dolls have a quilt as an accessory. This is to be made from pre-quilted fabric or a piece of a cutter quilt. 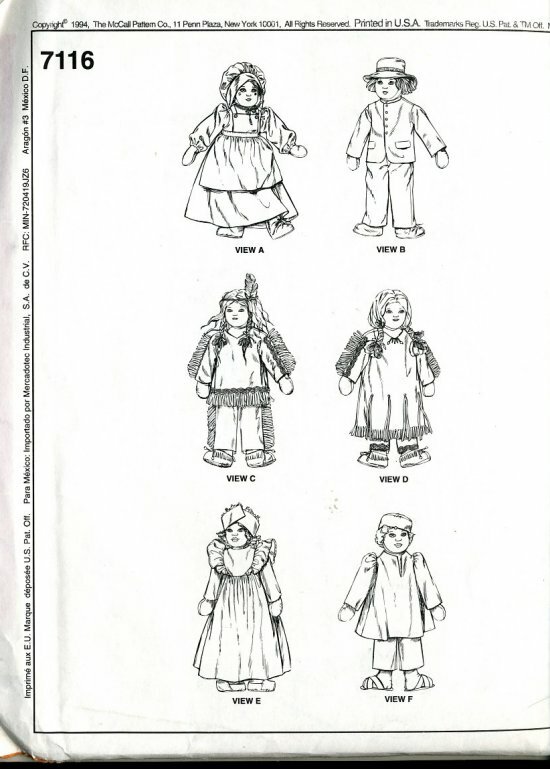 Although it doesn't look like a difficult pattern, due to the lack of detail in the instructions, it would likely be suitable for experienced doll makers only. The dolls as pictured on the front of the envelope are charming and have faces reminiscent of the antique hand painted Babyland Rag dolls made by Horsman. I haven't seen any of these dolls made up. If you have made this pattern, please share your experience.